I've been watching the Maria Wern TV series, produced by Swedish television and broadcast in the U.S. by MhZnetworks, and have been waiting anxiously for some of Anna Jansson's books (on which the series is based) to appear in English translation. The first has now arrived, as Killer's Island, translated by Enar Henning Koch from Jansson's 11th Maria Wern book, Drömmen förde dej vilse, published in English by Stockholm Text, a new project bringing Swedish books out in paperback and digital form. The first of their books is becoming available late this month (I was able to get galleys from Netgalley). The Maria Wern TV series is interesting for its Gotland setting and the characters (some of whom appear in the books, but in slightly different relationships with each other). The series is not quite to my taste: I'm more interested in the darker Swedish series, closer to noir, and Maria Wern is a bit more on the cozy side. The books take another step further away from noir, since Jansson is very interested in the conflicted private lives of her characters (at least she is in this book). Both Maria and her friend and coworker Erika are caught in relationships that are not going according to plan, and their love lives take up a considerable portion of the text (it seems like they take up more space than the mystery or the police work, but that's probably just my impression). Perhaps my problem is that beginning with the 11th in the series, I don't have enough background with these characters. The story itself goes from an attack on a young boy, during which Maria tries to intervene and is beaten and stabbed with a hypodermic syringe, causing her to worry about exposure to blood diseases. Then a series of murders begins, the first very lurid indeed and the next more matter-of-fact. All of the incidents seem to revolve around a very limited group of people, including Erika and her romantic attachment, who is a doctor. When the conclusion arrives, there's a somewhat contrived (and to me not all that convincing) final struggle in the sea. At the beginning, I was so annoyed by some of the writing (or the translation, a non-Swedish-speaker can't be sure). An example from the first paragraph is, "A pale dusk lay over the creased surface of the sea, lighting up the dark bastions of the city walls and the monastery ruins hailing back to another, more powerful time." And just after the discovery of the lurid murder, one of the detectives feels sick:"The vomit lurked somewhere in the region of his throat. He wasn't sure which exit it would take." There's something both overwritten and unclear about both passages. Fortunately, the writing settles down and from about a third of the way into the book I stopped noticing that sort of thing. The story kept me reading, but there are other recent Swedish crime novels that make better use of the Gotland setting (such as the books of Mari Jungstedt, whose newest novel, The Dead of Summer, is also appearing in the U.S. thanks to Stockholm Text) and of the myths and folktales of Scandinavia (Jansson evokes the tale of a bride who is drowned and returns to torment everyone, but the Öland novels by Johan Theorin make more extensive and effective use of regional myth). Still, I thought the book was interesting, and will certainly appeal to readers who find much of the recent Swedish crime wave a bit too dark: for instance, Jansson's book has a good deal in common with Camilla Läckberg's series set on the Western coast of Sweden. Both series put more emphasis on the marriages and love affairs of the detectives than do the series by some of the darker Scandinavian series. Balancing the two versions of Maria Wern against one another, I think I prefer the filmed rather than the written version. Though the cops in the filmed version have plenty of stress and misery in their private lives, the crime at hand takes up a bit more space in the story than, at least, it does in Killer's Island. 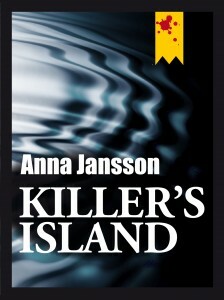 Perhaps someone who knows the original Swedish novels can offer an opinion about whether Killer's Island is typical and whether my impression of them is tilted by my lack of access to the originals? Looking forward to these Stockholm Text books- they are not yet available in the UK but the publisher via Twitter said that they will be available for UK kindles at some point. In the meantime have not read your review as have not read book, but will come back to it.